It's time to take care of your nails ladies! This week is Nail Detox Week, meaning we need to give our nails the care and attention they deserve. According to Elegant Touch's research, 75% of women dedicate less than an hour to the upkeep and appearance of their nails per week. That's a lot of neglect! I am probably the most guilty of this as I constantly harm my nails by applying acrylics, gels, stick on nails, biting etc. and rarely give them a breather! Well this week, that's all about to change. From my horror a few years ago my nails got to the worst state they've ever been after a long period of wearing acrylics and stick on nails. My nails started peeling, half of them came off with the acrylics and I ended up having half a nail and it took almost a full year to grow back completely. Ever since then, I've made sure to have a Nail Detox every now and then to give them some TLC. That's where these five bottles of nail love comes in. 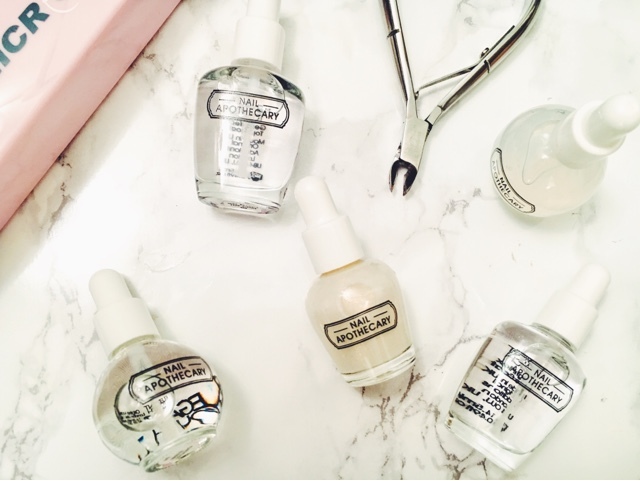 Each Nail Apothecary bottle helps and repairs your nails in different ways, and if teamed together, can breathe life into your nails once again. Containing Sweet Almond Oil, Vitamin E and Vitamin F.
Deeply nourishes damaged and dry cuticles, protects and conditions the nail plate, revitalises and restores the skin's natural moisture level and moisturises and hydrates formula to leave cuticles and nails soft and smooth. Softens dey and ragged cuticles for healthy nail growth, moisturises formula allowing efficient and painless removal, allows immediate and easy push back of overgrown cuticles and makes the nail contour appear polished and well-groomed. Containing 24KT Gold flecks, Lingonberry seed oil and a Keratin-like formula. Instantly improves the appearance of imperfections, promotes strong healthy nail growth, UV filter protects the nail from discolouration and yellowing and improves wear when under colour enamel. Containing Naturally derived plant keratin and a UV filter. Creates strong bonds between your natural nail bed and nail enamel, cellulose-based multi-tasking formula acts as a primer for nail enamel and protects against chipping and triple complex Keratin adds strength to weak and brittle nails. Fast drying formula gives a velvety matte finish to your nails whilst keeping them hydrated and protects against peeling and damage. Fast drying for a cushiony gel-like manicure, provides improved colour fidelity and longer lasting wear, protective UV filter protects lacquer from discolouration and contains no harmful ingredients! I know I'll be using all 5 this week to ensure my nails are the best they can be! Which combinations will you go for? Ooo I've never heard of a nail detox but I definitely would love to give my nails some more care and pampering! My cuticles especially need a bit of TLC as I often get painful hang nails! Elegant Touch have a range of 8 different treatment polishes (2nd post on the rest is going up at some point next week). You can give your nails a fresh breath of life with the entire range!